This post will discuss the midcredit scene at the end of the movie Avengers: Age of Ultron. If you have not seen the film then do not read more. There is a very brief Mid-Credit Scene in the Avengers Age of Ultron. The scene depicts the villain Thanos who has apparently just witnessed the Avengers victory over Ultron. Thanos reaches into a vault and pulls out a metal glove. With a smile he says that he will need to do it himself. Thanos is one of the most powerful villains and is bent on destroying all life in the universe. He is like an Ultron but much worse. Thanos is key villain in Marvel storyline called the Infinity War where Thanos gains control of all the Infinity stones and unites them onto a metal glove called the Infinity Guantlet. Each of the stones provides massive God like powers to the user, and when combined the together the user is nearly omnipotent. With the power of the stones had his command Thanos is easily one of the greatest threats ever faced in the Marvel universe. For this reason this scene could be seen as a direct lead into the Avengers: Infinity War movies. Thanos is now going to take the battle directly to Earth. The metal glove being reached for in Thanos's vault appears to be a Gauntlet like the Infinity Gauntlet in the comics. Interestingly, another Gauntlet appeared in movie Thor. 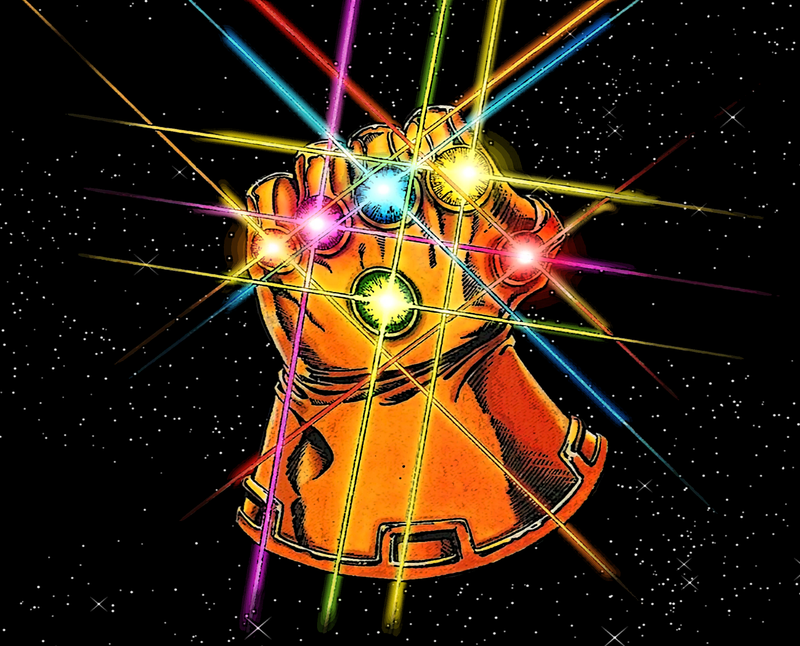 This Gauntlet it has been confirmed is not the same as the one being used by Thanos. Kevin Feige also revealed in an interview with Cinema Blend that the Gauntlet being pulled out by Thanos is not the same one shown in the film Thor. "There are two different gloves. That was not Odin’s vault that you see at the end." I am not entirely sure what to make of this development but I have two theories. 1) Loki in Avengers is shown as being a pawn of Thanos. Loki is currently masquerading as Odin on the throne of Asgard. It is possible he stole the Gauntlet out of the Asgard Vault and gave it to Thanos. The gauntlet in Asgard's vault now is simply a replica to avoid suspicion being aroused. 2) In the MCU there are two gauntlets perhaps part of a set that for unknown reasons was separated. Evidence of this is that one gauntlet is right handed and the other left handed. Thanos does not have all of the gems in fact he may not have any. Only two of the Infinity Stones are unaccounted for which means he has either the time or the soul gem. My guess is that if he does not have one it is the time stone. One other item to keep in mind. It appears that Thanos gave Loki the Mind Gem with the thought that it would destroy life on Earth if Loki failed. Thanos predicted that humans would tamper with the gem and begin seek out information that could destroy them. As seen in my post about Loki, Lorelie and The Xantos gambit, there seems to be a long game being played by Loki and Thanos that the heroes are not yet aware of.